John Coulson did a live 10 minute interview on the Hancock and Kelley Show. The hosts (Hancock and Chris Mihill) were substituting for the regular Charlie Brennan Show. Coulson discussed the Wee Willie Sherdel book with host John Hancock. KMOX is a 50,000 watt flagship station for the St. Louis Cardinals and covers the Midwest. The program can be accessed through the KMOX website. The interview begins at 28:18 on the program. Hancock used the words "wonderful, wonderful" and "great" to describe the book. He suggested Sherdel should be considered for the Cardinals' Hall of Fame. ​ Watch the video here. ​"​The man who struck out Babe Ruth in the 1926 World Series had humble beginnings in Hanover. Bill "Wee Willie" Sherdel is the winningest left-handed pitcher and fourth all-time winner in St. Louis Cardinals history, serving the team for 14 seasons. He pitched the third-most games and fourth-most innings. Sherdel played among the greats, like Ruth, Lou Gehrig, Ty Cobb, and Rogers Hornsby. "Despite his accolades, Sherdel never became a household name in the way his colleagues did. A baseball buff and author teamed up with Wee Willie's grandson to write a book to change that..." Read the full story here. 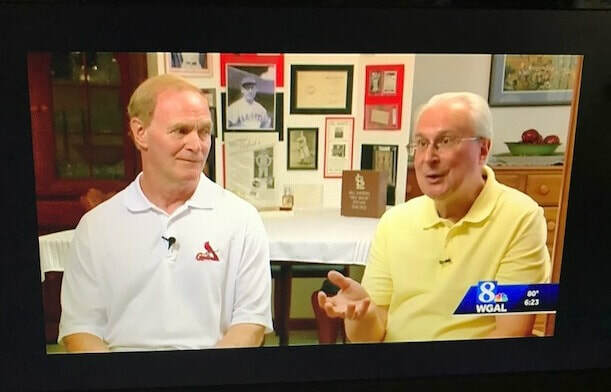 The story behind mcsherrystown's wee willie as st. louis cardinals' "winningest left-hander"
​"John Sherdel remembers catching pop flies from his grandfather at their home in McSherrystown. "Bound to a wheelchair and decades removed from his professional baseball heyday, Bill Sherdel had quite the story to tell. Before tossing baseballs to his grandchildren, he did it on the nation's biggest stages against players like Babe Ruth and Lou Gehrig..."